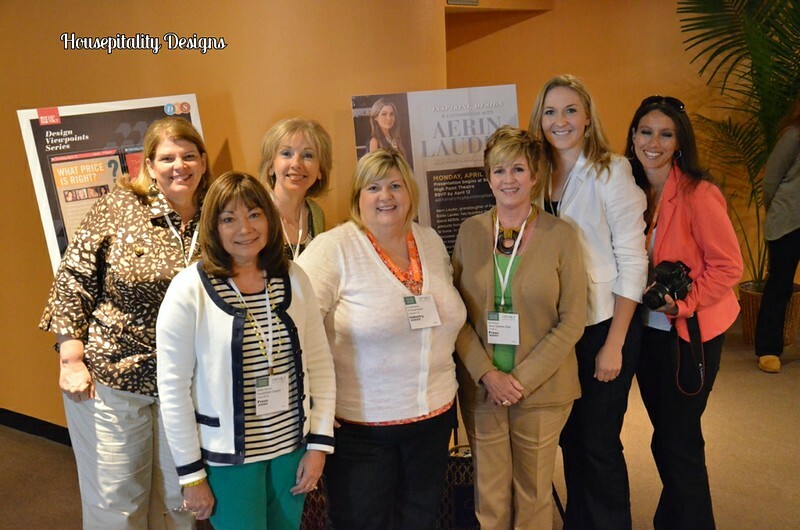 I had the best time hanging out with a few blogging pals in High Point, NC at the furniture market. This market takes place twice a year. You would think with this being the spring market that it would have been warm, but a cold front moved in and we were quite cold every time we had to go outside and wait on a bus or shuttle to get around. This was my first time ever attending a market and it was so big and crowded, but we had so much fun. What's not to love being surrounded by all kinds of beautiful home decor? Here is a group shot of us wild and crazy gals. I borrowed this photo from Shirley who was my gracious hostess at her home.From the left back row is Suzy of Worthing Court and Rhoda of Southern Hospitality. Front row from left isShirley of Housepitality Designs, Amy of Atta Girl Says who is the one who put this together for us, me, Kristen of Sophia's Decor, and Courtney of French Country Cottage. This photo was taken on day two. There was so much to see and we barely scraped the surface of what was there to see. You could probably stay for a month and not see it all, but it only runs for a week and we just had two days so we crammed in as much as we could and we were exhausted at the end of each day, but you just push through it. We went in so many showrooms and I don't remember the names of all of them, but this photo and the next three was Noir and they had some really cool pieces. I love this black bamboo piece. I loved this light, but it is huge and would need a really large room to hang in. There was plenty of chandeliers, sconces, pendants and lamps to drool over. I didn't even notice that the pieces on the table have lips. Funny how you notice things later in the photos. I really would love to have this one in my great room. Loved this bookcase with the iron latched doors. Or how about a set of them? Then we came up on Amy Howard at Home line of paints. Everything in their showroom was finished with the Amy Howard products. They were sharing how to use the products in the afternoon, but we has a show home tour to go to. Love the finish on this chair. This chair color and the fabric is so pretty together. She also has a line of very pretty metallic spray paints. Then it was on to the next room. I really wanted one of these to go home with me. We saw lots and lots of vintage olive buckets. These are hanging on the wall. More buckets hanging above all these other goodies. Yummy trophies and leather bound books. I love ginormous clocks and this was a beauty. Some old confit pots that I hope to find in France. Kristen and I found these pretty cool. They are made from paint can lids. If any of you have followed me very long you know I have a thing for pillows. I was in pillow heaven in High Point. One of our favorite showrooms was Eloquence. They had some really pretty pieces and you can order the furniture in different finishes. This photo is a little fuzzy. Btw, I was using my point and shoot. Didn't want to haul the heavy camera. This was so pretty and so simple to do. Just stuff a big chippy worn urn with Spanish moss. That is most of what we saw on day one before heading to the Women's Junior League show home. I will share that soon plus more photos from day two that I need to go through. I took 195 pics the first day and 150 the second so I have only shared a few with you. Be sure and come back tomorrow to tour another beautiful favorite room. This $100 giveaway is still going. If you haven't joined click here. It ends Saturday. Goodness ... my mouth would have been open the entire time in awe of all of the incredible eye candy! Actually, I would then have been too overwhelmed and have to leave! LOL. Glad you girls had fun! Oh Kim....I am sure you were on overload! It's crazy good huh??? You were in several of the showrooms that I was buying in, Kim. Interhall was a wealth of goodies this spring market! I saw the demo with Amy Howard Paints on Friday- she and I chatted for about 15 minutes and I absolutely loved her products! It was a whirlwind trip for us- a buyer really DOES need lots of time to explore. You often can't get out of your company's niche because of the time factor. Glad you got to see a little of what we do when we go to market. Oh my, what a feast for the eyes! My favorite was the white book case with the iron latched doors. The keyboard on the wall was pretty clever too. Thanks for sharing part of your trip with us. I'm looking forward to seeing more! I can't imagine all that inspiration in one day. My head would have been swimming! What a great trip. Looks like a lot of fun!! Beautiful displays. Lots of ideas. I need to go there someday! Lots of goodies to explore! Love those paint can lids, who would have thought~Great idea. Looks like my kind of day just browsing around. Can't wait to see the rest of the photos you took. How fun! That is such a great picture of you all. Kim, This looks like so much fun and you had a great group of gals to share it with. Thank you for sharing Kim! What fun! Love that paint lid idea!It really does look like typewriter keys!Love the olive buckets hanging too! Oh my like big kids in a candy shop! How fun Kim, I loved everything! Wow! Everything in those showrooms is beautiful! I loved those baskets with the black and white paint on them too. I bet you can make that yourself! Probably save some money too. I bet your feet ached at the end of the day. Looked like a lot of walking was involved. Hope you brought some good shoes with you. Can't wait to see the rest of your pics! Kim...I would love to know the name of the company's that these photos were taken of...they had some pretty interesting things..
heavenly! That looks like so much fun-spending 2 days in interior decor heaven WITH other people who love it as much as you! fun! Kim, so fun to see the furniture mart through you eyes, thank you for sharing. I died when I saw the image of the typewriter keys! WANT! I especially love the typewriter keys...umm... Any information on where or how it can be purchased. Also, growing up down the road from High Point made me miss home and all my southern foods all over again! Glad you had a great time. You got some great pics! After going through all of mine, it was so hard to pick ones to go on the blog...way too much eye candy! OH, I wish I were with your group. What a fantastic place!!!! LOVE the urn and moss! YOu are right... so simple!!!! I would have loved to have been there! So much to see! I can't tell which thing I like best, but the typewriter keys have my mind racing! WOW, Kim- My computer is down so I haven't been visiting like I did. THAT show must have been a blast. I love all the lighting and so many neat things. Those planters with lips were big here for the past 5 or 6 years. I would have been drooling over the pillows. Kim, you just put together a spread of photos more fun to look at than a Pottery Barn catalog. Problem is, now I want to go shopping. Thanks! Awesome trip Kim! I love the typewriter keys! Thank you for showing it! Wow! So many pretties. I see two lamps I would LOVE to have! Lucky you to be able to see all the wonderful showrooms, but also hang with blogging friends. That black bamboo piece has my name all over it! where to start, love it all, but those paint can lids are super cool! It was great seeing you at the market even though my time was cut a little short. How did I miss the keyboard???? I just realized that I, too, have all these pics and won't be able to recognize or remember what the names of all of the showrooms were. Oh well, its the eye candy that counts right? Wow....my kinda place! Loved it all, but I really love the typewriter key paint can lids...that was so cool! Great pictures! I had such a wonderful time with you and everyone else in the group! In spite of how exhausted I was, I hope we can do it again sometime. It was great getting to spend time with you! Oh wow!! Lovely pictures and looked like soooo much fun! Typewriter key paint lids...who'da thunk! So cool! I've not heard of Amy Howard paint...has anyone ever tried it? Would love to order some but can't seem to find a color chart online. Anyone help me out? How fun! I would be dangerous in a place like that - I would have to leave all cash, cards, and check book far far away! Everything is so beautiful and so much great stuff to look at and drool over. Love the chairs. Looks like it was a great time. Oh how I would have loved walking through all of that! Thank you for the pictures! I so hate that I had to cancel at the last minute. Glad you girls had fun! I am finally finding time to catch up. I really enjoyed seeing all these images from High Point! Lots of great inspiration. I'm drooling over EVERY picture! Wow...I wish we had a market like this in Canada - even if it was only once a year. Thank you for sharing. So much inspiration in these pictures alone! Wow...I'm dreaming beautiful room makeovers!!! Lots of great stuff, but if I had a wall big enough the paint can lid typewriter keys would be my next project. I pinned that, way cool. Wow...looks like tons of fun! LOVE the wall of paint can lids...very cool and clever!